A stunning Giant Plat at 16 inches from the Savoie that is truly one of the rarest and finest, we have ever procurred. . This, is a first. 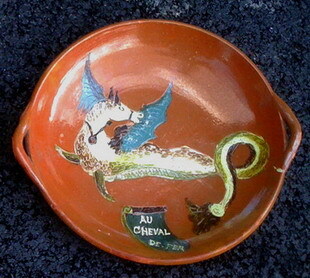 From a very rare collection of Savoie pieces that J&V wroke with, this 'one-of-a-kind' giant plate for hanging on the wall was made (obviously) for an establishment called 'Au Cheval de Fer' (At the Iron Horse). A mystery! Perhaps an inn or bistro or perhaps a shop that specialized in utensils and products needed for the horse. Everything about this plate is J&V all the way. Th design is one of the most elaborate in detail ever found on a plate from this region and the colors of the maginificent glaze are so stunning. The size and handles just add to the overall 'uniquness' of this decorative piece of Terre Vernissee that hung on a wall...would be consider also a work of art. What a grand size for a piece so old and in perfect condition. It makes a great French Country statement and works beautifully in a home of all styles, formal or rustic country. You won't find another like this one at this size or true age. Tres Joli!